“Microfiltration” wine filtration is a process of passing wine through media to remove particles that are suspended. The filter barrier prevents the passage of particles above a determined particle size. All microfilters are “nominal” filters not “absolute” filters, which will be defined in a bit. Two types of microfiltration systems are well supported for home winemakers. Both require carefully choosing the correct size media porosity for the greatest effect. The current available sizes range from 0.45M to 5.0-8.0M. In general, 96-98% of the particles larger than the rating will be retained in the media and removed from the wine. 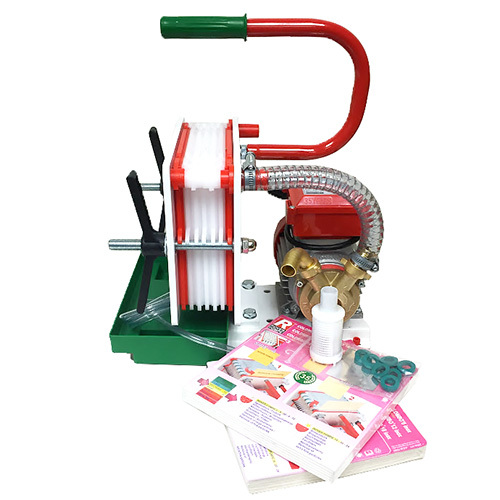 A cartridge system utilizes a 10” cartridge made of wound polyester/cotton string, or perforated nylon on a stainless core, which is fitted in a polycarbonate or stainless housing fitted with inlet and outlet ports. 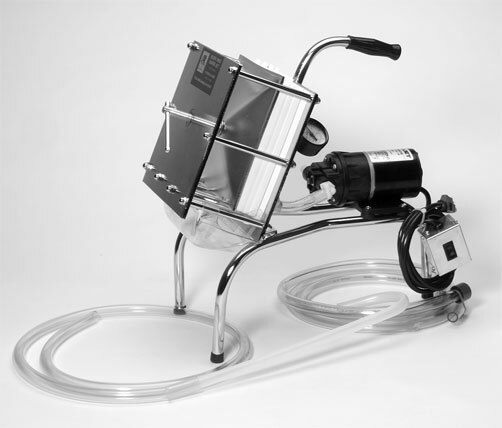 A pump moves the wine through tubing into the housing and the filter holds back particles larger than the media rating, while passing the wine out the exit tubing. 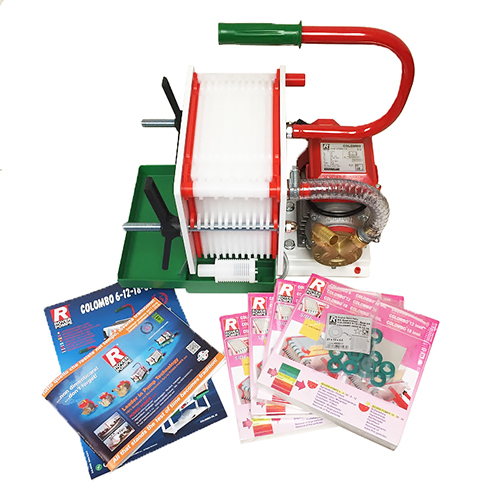 A plate/frame system similarly uses a pump for the passage of the wine, but the wine moves through a square sheet of media made of cellulose fibers with a filter aid such as perlite or diatomaceous earth plus a resin binder that adds strength to the pads. The pads are fitted between plates that are patterned to channel the wine to the outlet while the pads retain the removed particles. Why run wine through filtration? It’s best to think about filtering as one tool that can be used when gravity, fining and aging haven’t removed visible haze. If laboratory analysis reports the presence of spoilage yeast or bacteria, filtration is the main choice to remove these prior to bottling. What equipment is required to filter wine? The Beverage People plate filter is made by Buon Vino. It holds three pads that can process 30-45 gallons. In addition, for larger volumes we sell a six plate and twelve plate filter produced in Italy. These all come with a pump. a 10” cartridge housing, a filter cartridge; three sizes to choose from (F10, F11, F12) and the inlet and outlets with 1/2” tubing. Our suppliers still call 0.45m filters “sterile” even though that isn’t a correct term. In practice, the wine passed through the 0.45m filters is as sterile as you will get in home winemaking, but these do not remove bacteria below that which means these filter media are actually nominal, not absolute. The amount of money needed to purchase an absolute filtration system isn’t even on the table for most small wineries. What happens to a wine if the effective filtration leaves behind 2% or more of a bacteria or yeast? In the case of a spoilage organism, like acetobacter, the wine will continue to degrade in quality during storage, because the bacteria will continue to produce some volatile acidity. Bottling soon, adding sulfite and storing cool will slow or stop the increase of volatile acidity, but there will always be a flaw in the wine flavor and aroma. In the case of yeast, any remaining residual sugar could restart a fermentation in the bottle. Good insurance against refermentation is supplied by adding sulfite and potassium sorbate (Sorbistat) at bottling time. Use the sorbate at the recommended dosage of 1 gram per gallon, stirred into wine at bottling. In the presence of Brettanomyces; off aromas can include cloves, barnyard, horse hair, horse sweat, plastic, Band-aids, and mousey, all good things to avoid if possible. Brett can be removed with 0.45m filter media, but whether or not 2% remains, the wine will already be tainted, and will not improve after removal. Look below for more information on best practices to avoid spoilage organisms. 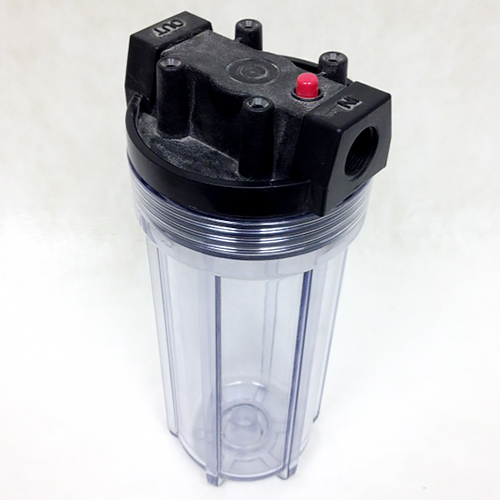 The most common tool is a cartridge/housing configured with an absolute membrane filter. They are used on mobile bottling lines and only used when the winemaker is sure that the wine needs this final pass. Larger wineries can also use a Crossflow filter, which has media available for both microfiltration and ultrafiltration. 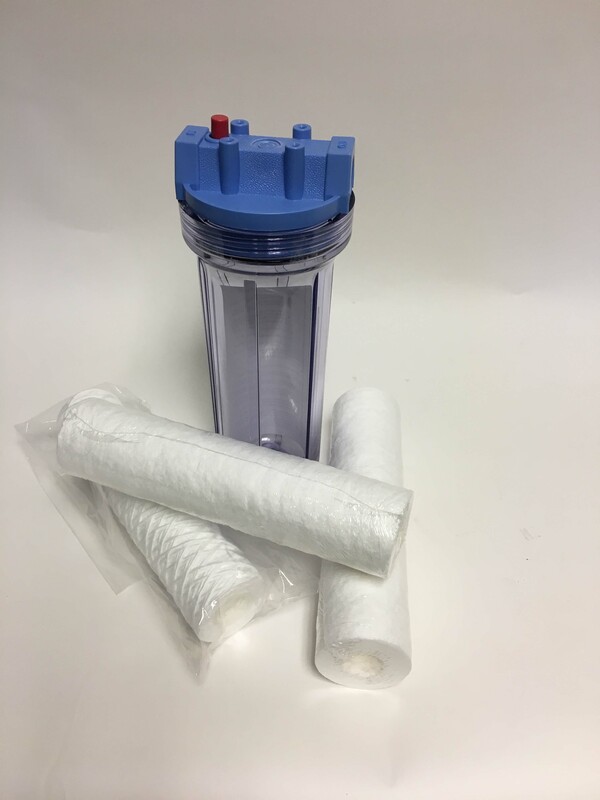 Some of the advantages of this filter that overcome it’s very high cost include: the ability to 100% remove Brettanomyces, zero absorption into the media so no wine is lost, and single step filtration to reduce multiple run costs associated with other types of filtering. Clarify using gravity and rackings for most wines. Cold stabilize wine, storage at 45-50 degrees or colder for 1 month or more to drop out the tartrate crystals. Fine the wine with a clarifying aid such as Sparkolloid a month or two prior to bottling if needed. Alternatively experiment with a bench trial to see if another fining agent will do a better job than Sparkolloid. See Bob Peak’s article online: https://www.thebeveragepeople.com/page458.html. Clean and sanitize all winemaking equipment to prevent the growth of spoilage organisms and wild yeast. Particularly with barrels, good cleaning and proper storage between vintages is very important. Follow our barrel care procedures. See https://www.thebeveragepeople.com/page453.html. Also for cleaning and sanitizing see https://www.thebeveragepeople.com/cleaning-and-sanitizing-101.html. Use commercial yeast to keep out unwanted yeast. Set up the filter to run with enough media to ensure completion of the run – i.e. don’t start and stop the filter as that loses the flow channels and may pass more solids after it is restarted. Prepare the filter sheets according to instructions provided with proper insertion and tightness. These will be provided with any rentals or new purchases. Use a pressure gauge to determine the end of the run; when the pressure rises more than 15-17 psi from the starting pressure, it is time to disassemble and change the filter media. Adjust sulfite level in wine prior to filter run because it will be exposed to additional oxygen. Refer to our SO2 chart in the newsletter or online. In general, levels of 20-30 ppm are adequate. Check the SO2 again after the run, within a week or so, and adjust again if there is a loss. The Beverage People have a three plate Buon Vino available for rental. 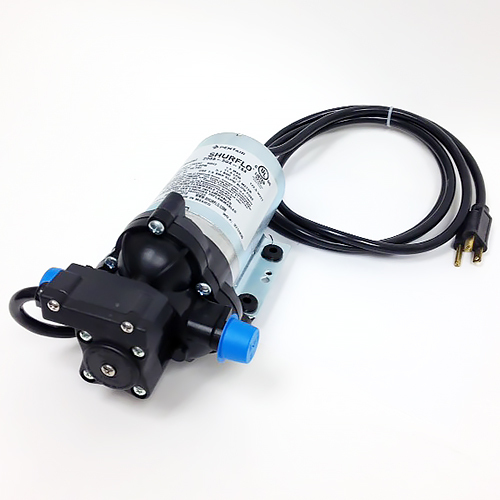 A rental includes one set of filter pads and the necessary hose to reach both 6’ on the inlet and outlet plus a racking tube – all 1/2” in diameter. Call the store to make your reservation. See our rental rules : https://www.thebeveragepeople.com/services-and-rentals-equipment-rentals.html.